A pair of trios dominated on seemingly every shift, as the line of Arthur Kaliyev (Hamilton Bulldogs), Peyton Krebs (Kootenay ICE), and Nick Robertson (Peterborough Petes) found immediate chemistry with Team Cherry as they combined for eight points on the night, while the Team Orr grouping of Ottawa 67’s right-wing Graeme Clarke and London Knights forwards Matvey Guskov and Connor McMichael collected three points, including McMichael’s game-winning goal en route to a 5-4 victory for Team Orr. The anticipated top performers lived up to the hype in the instant classic, as Clarke, who earlier this week was named the 56th North American skater in the midterm rankings by NHL Central Scouting (CSB), was recognized as the Jim Gregory Player of the Game for Team Orr after finishing the night with one goal and one assist. Meanwhile, a two-point effort helped Krebs, the eighth-ranked North American by CSB, take home the Player of the Game distinction for the Team Cherry squad. It was an evening for statistics fanatics as a handful of new high-water marks were set, including Kaliyev’s tally just 56 seconds into the opening frame, as the Bulldogs right-wing scored the fastest goal to open a game. The top spot was previously held by then Prince Albert Raiders forward Greg Watson, who needed just 79 seconds before finding the back of the net at the 2001 Top Prospects Game. 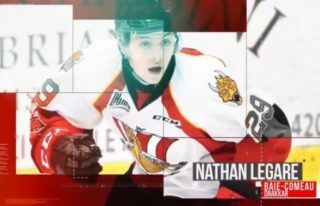 The record books nearly saw another new entry Wednesday as well when three of Team Orr’s third period goals, notched by 67’s defenseman Nikita Okhotyuk, Raiders centre Brett Leason, and McMichael, each tallied in a combined 72 seconds, just five seconds longer than the all-time mark set last year by Owen Sound Attack forward Aidan Dudas and Flint Firebirds captain Ty Dellandrea, who potted two. However, there was one more impressive feat in Red Deer as the showcase saw its biggest comeback win in event history, as Team Orr’s four unanswered markers in the final frame set a new high mark at the 24th annual game. The underrated star of the night who surely grabbed the attention of the 200-plus talent evaluators in attendance at The Centrium may have been Robertson, who finished with three assists, including a highlight-reel helper in the first 20 minutes as he pulled off a spin-o-rama set-up on Kaliyev’s opening goal. The American-born left-wing has recorded 33 points in 31 games in his second season with Peterborough, good for the Petes’ team lead in scoring. 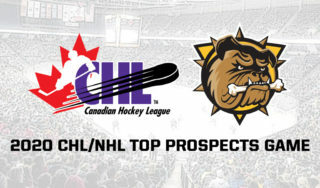 Entering Wednesday, Robertson was ranked the 30th North American skater by CSB, but further performances like his efforts at the prospect showcase will surely see his name climb the ranks. It’s never easy to be between the pipes facing effectively all-star caliber rosters, but Wednesday’s four netminders – Colten Ellis (Rimouski Oceanic), Hunter Jones (Petes), Mads Sogaard (Medicine Hat Tigers), and Taylor Gauthier (Prince George Cougars) – all proved their worth as top-shelf up-and-comers as each ended the night with a handful of highlight-reel saves. Most impressive may have been Sogaard, as the hulking Danish goaltender allowed just one goal and turned aside 17 shots from Team Orr, including all eight in the opening frame as he was peppered often by the opposition but held on to Team Cherry’s early lead.